Welcome to my first installment of obscure player watch! Once every so often I will produce this style of article which hopefully provides an interesting insight into the kind of footballing talent which the sporting press often fails to report on. A look into the career of Aleksandrs Cekulajevs is where my new concept will kick-off! I stumbled across this player whilst carrying out research on the ‘European Golden Shoe’. This is a goal scoring accolade which is awarded to the player who scores the most goals in their domestic league across the whole of Europe. The usual suspects dominated the top of the charts. Cristiano Ronaldo, Lionel Messi and Robin Van Persie make up the top three. Currently just in behind them is Cekulajevs. A player so much so in the shadows that I naturally went to research his career on Wikipedia to find that he doesn’t even have a page. Cekulajevs boasts a remarkable goals to games ratio. He sits in 4th place in the race for the golden shoe with a staggering 46 goals this season. Why is he not top you may be wondering? Positions in the award are calculated based on multipliers. Due to Cekulajevs playing most of this season in the Estonian league, his 46 strikes are not multiplied due to the Meistriliiga being recognised as an ‘inferior’ league. Ronaldo on the other hand, has had his 29 domestic goals multiplied to a points total of 58, putting him in top spot. 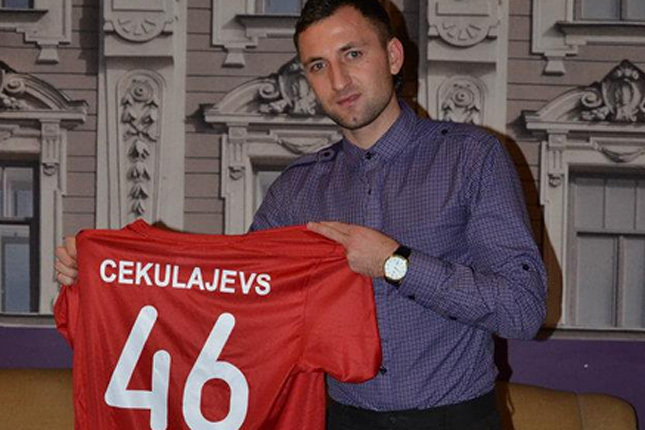 It is well worth noting that Cekulajevs scored his 46 goals whilst playing for Narva Trans. Due to the format of the Estonian league which Narva Trans competes in, the season is effectively over. In search of playing time, he has now joined Valletta in Malta who run their season in conjunction with the majority of Europe. He is already off the mark for them, scoring on his debut. The 26 year old started his career at Latvian club FK Riga. After only being handed 6 appearances he moved to FK Auda. This is where he really began to make his mark. He notched up a total of 51 goals in 30 games. His other notable goal scoring achievements include 11 goals in 18 games for FK Náchod-Deštné, 10 goals in 17 games for Víkingur O’lafsvik and his well documented 46 goals in 35 matches for Narva Trans. Will he ever get a big move? It’s hard to say whether he will make a huge step in his career transfer wise. A major disadvantage is his age. I can’t help but think that if he was five years younger clubs would be more interested. If he was to be signed now by a major European club, he would risk being bottom of a pecking order behind the club’s ‘superstars’. If he were to have made a move of this magnitude at a younger age, clubs would have been able to convert his raw talent of goal scoring into something a lot more formidable. It has also been apparent that managers are now becoming aware that strikers who score vast amounts of goals in the lesser leagues often become flops as they reach the big time. The most notable example is Afonso Alves. His record for Heerenveen was unprecedented, scoring 45 goals in 40 games and yet he only netted 10 times in his 42 games at Middlesbrough. Cekulajevs had hope of signing for a huge team when AC Milan’s interest was broken in the press. It turned out to be nothing more than speculation. I understand that it is difficult to judge a player’s talents when he operates in small leagues. But to sign a player like Cekulajevs, a club would not be paying more than £500k as a transfer fee and he would be more than willing to accept a mediocre contract. He could well be considered a calculated risk who could pay dividends for a club that might want to gamble on him in the near future.